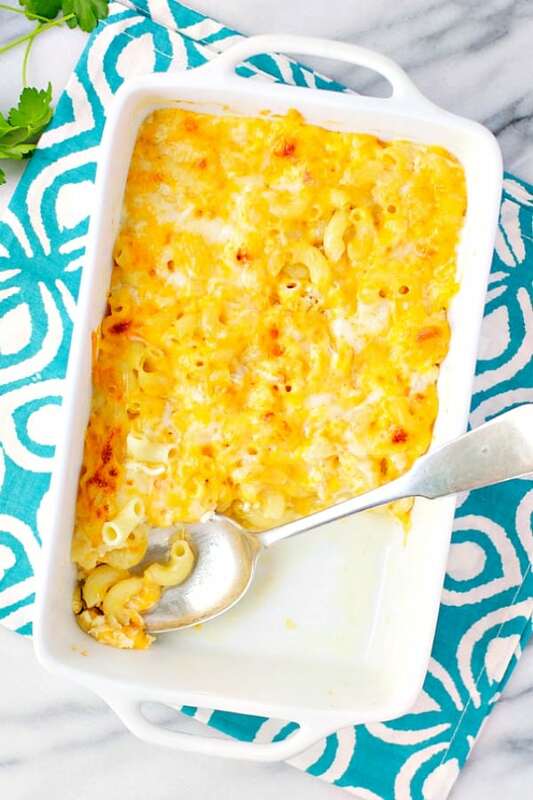 The easiest mac and cheese made made with overnight prep it's so easy and delicious! 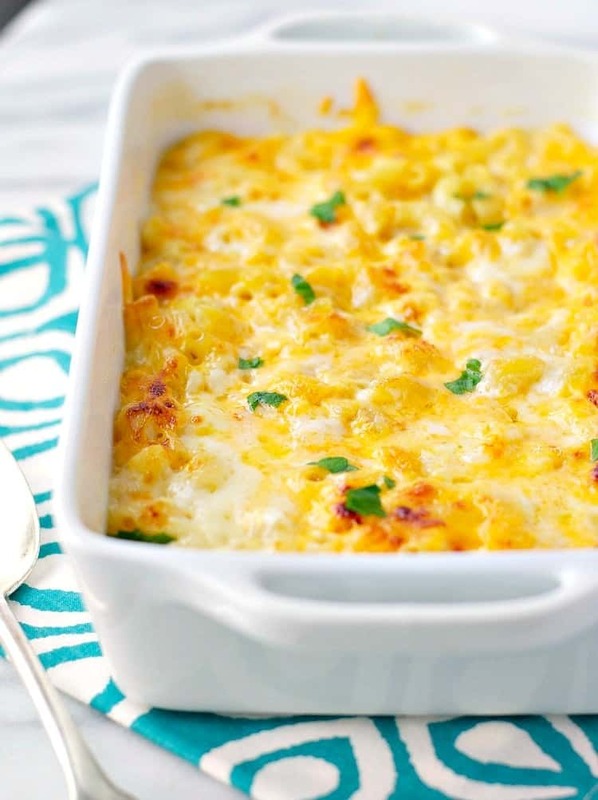 You don’t even need to boil the pasta for this Dump-and-Bake Overnight Macaroni and Cheese! It’s an easy side dish for weeknight dinners, holidays, and potluck meals with family and friends! Dare I say it? 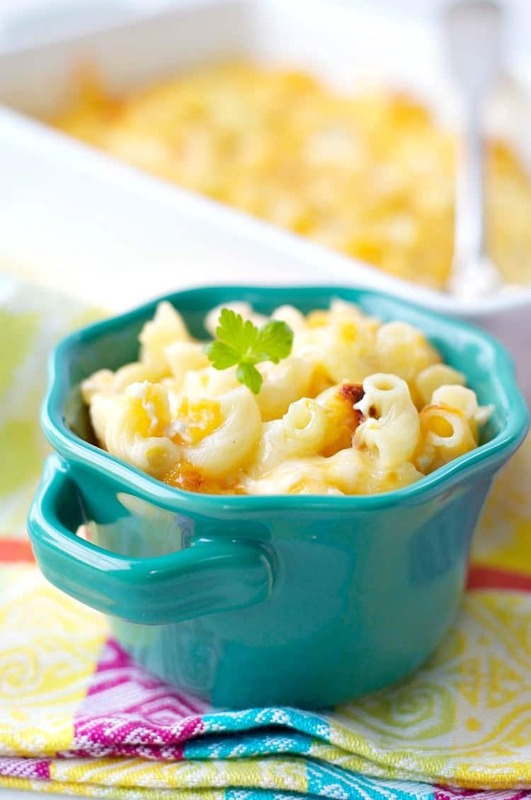 This incredibly easy mac and cheese recipe has surpassed my kids’ love for the boxed stuff?! At one point in their lives I didn’t think that would ever happen! Obviously, I couldn’t be happier about it. Not only is this recipe almost as simple as the microwaveable stuff in the cups, but it’s WAY more nutritious — thanks to just a few simple ingredients. Real cheese, a teeny tiny bit of butter, pasta, and milk. Just like it should be, right? This genius creation is not my own, though. Today I’m sharing a recipe that my hairdresser gave to me years ago. She has three boys of her own, and she was so excited to tell me about this “method” for making mac and cheese because her family has always loved it. She shares it with customers and friends regularly, and often hears stories about folks making it again, and again, and again. So you get the idea, right? It’s really good! And let me repeat myself — you don’t even have to boil the pasta! Just layer the ingredients in the dish, let it sit in the refrigerator overnight (or for a few hours), and bake it off when you’re ready. I love to serve this for Sunday supper when we grill or roast some chicken, but it’s also great for parties or holidays when you need an easy and comforting side dish but you don’t want to have to bother with it at the last minute. Grease a 13-inch by 9-inch baking dish. Spread half of pasta in bottom of dish. Sprinkle with half of cheese, dot with half of the butter, and sprinkle with half of the salt. Repeat layers using the remaining pasta, remaining cheese, remaining butter, and remaining salt. Pour milk evenly over pasta, cover with aluminum foil, and refrigerate for approximately 24 hours. Bake, covered with foil, at 350°F (180°C) for approximately 45 minutes. Remove foil during the final 10 minutes to allow top to brown. *I recommend using a block of cheese that you shred by hand on a box grater. The pre-shredded cheeses that you can buy at the store include stabilizers, and I don’t think that they melt as nicely in this recipe. I love this! 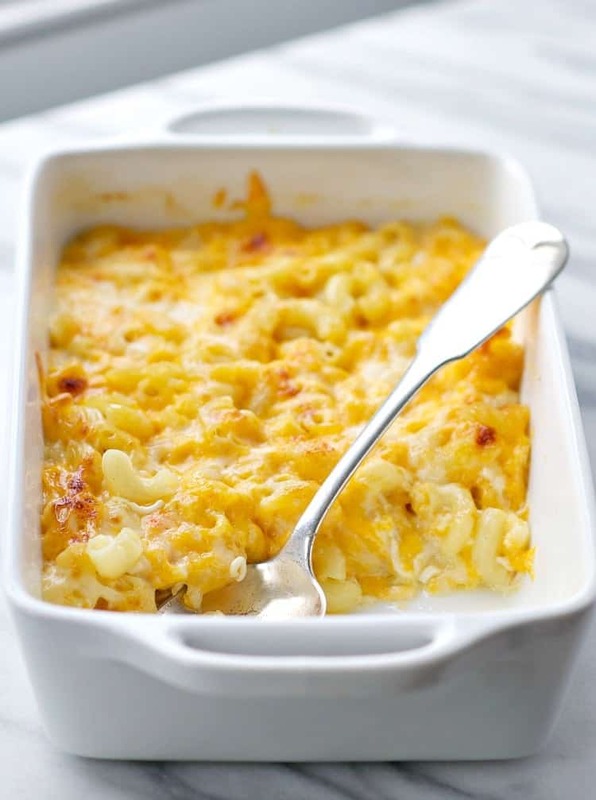 My all-time favorite food is mac n cheese! IS 2 CUPS MACARONI EGUAL TO 1BL? CAN CANNED MILK BE USED? Hi, Jean! I’ve never tried it with canned milk. Is the canned milk the same texture as regular refrigerated milk? If so, it would probably work fine! Just don’t use something with the consistency of condensed milk or evaporated milk. You make the best dump and bake recipes, Blair! I can see why your kids like this better than the boxed kind. And I’m so impressed at how easy this is to make, too! 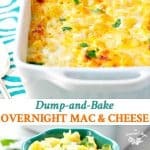 My husband loves mac ‘n cheese, so I will have to surprise him with this one night. Pinned! Thanks, Rachel! It doesn’t GET any easier! Oh yes!!! Loving this method. Anything to make life easier. Plus who doesn’t love mac and cheese. My ultimate guilty pleasure!!!! THE BEST method — DUMP IT! 🙂 Hah! Thanks, Chrissa! This is in my frig now. I can’t wait to try it. How cool! I can build it before bed and then have it ready to pop in the oven after work! I can’t wait to try it! Mac and cheese should be a no-brained to make, but I always somehow mess it up. I am making your recipe which is in the fridge right now. I have high hopes this will be great! Excellent! I hope that it’s a winner in your house, Heannie! I love your simple recipe for mac and cheese, but it was to much for a single person. Do you happen to have a recipe that serve only two people. Hi, Tonya! Yes, you can definitely prepare this dish to serve a smaller or larger crowd. The recipe is written to serve 8, so if you want a version that serves 4, you can just cut the ingredients in half. To serve 2, you would want to quarter the ingredients. For instance, you would use 1 cup of milk, 1/2 cup uncooked macaroni, 1/2 T of butter, 4 oz cheese, and a pinch of salt. Bake it for the same amount of time, but use a smaller dish or individual ramekins. Hope that helps! Do you think I could prepare the night before, as per ithe recipe and put in my casserole dish for my slow cooker then insert in morning and slow cook? That’s a great idea, Shepherd! I think it would probably work, but I have no idea how long it would cook in the Crock Pot. Pasta that size doesn’t usually take too long, so I would guess only a couple of hours. Let me know if you give it a try! Do you think this could be made with gluten free pasta? Hi, Kehler! I have never cooked with gluten free pasta, so I have no idea how it compares to regular pasta in a dish like this. Did you have success with gluten free pasta? Hello! If I wanted to make this for a larger number of people (10 or so) and do 1.5 the recipe, do I increase the time it bakes? Hi, Holly! The pasta will need the same amount of time to cook, no matter how large your quantity. So I’d start with the exact same baking instructions, check it, and add a few minutes if necessary. It shouldn’t be much different, though. Enjoy! I was pretty excited to make this because we are staying ina hotel long term. I also found that it turned out like milk and melted cheese and was kinda bummed. My kids are visual and they weeent into it. It seemed like a lot of cheese and not a lot of noodles to me. Have you ever increased the noodles? I liked the idea and I’m trying to figure out how it turns out like Mac and cheese and not milk, noddles and melted cheese. Hi! I haven’t had that problem with it being too liquidy. 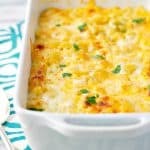 It’s going to be different than a Kraft Deluxe creamy mac and cheese where you make a white bechamel sauce first (since this doesn’t include a bechamel sauce at all), but your final product should be fairly dry — the pasta absorbs the liquid. I’m not sure what went wrong with your recipe? Does it have to be 24 hours? Will about 16 hours do the job? This recipe sounds like it could work for us. We make a free meal for 150 people once a month. Most of them are kids so I thought mac and cheese sounded good until looking for recipes, so complicated. We make food in large roasters. How much would it take to make enough for 150 people? Do you think this would work with unsweetened almond milk? Trying to make a diary free version. Has anyone tried,freezing this recipe? I’m using at a small private school once a week for hot lunch, the kids love it!! Would love to be able to make several at a time and defrost as needed. Could I ysespaghettii stead of elbows? Made this delicious recipe for my family during the holidays. INSTANT HIT! Thank you. Going to take it to a Super Bowl Party and want to know if you think it will work in a heavy-duty cardboard disposable pan. Hi, Phyliss! I’m so glad that you all enjoyed it! I’m not familiar with the cardboard pans, so I can’t really weigh in. Is the pan sturdy enough to withstand the liquid overnight without disintegrating? That would be my only concern. Otherwise, it should work fine. If you have access to one, you could definitely use a disposable foil pan. Yes! I would like to make it for a family get together tomorrow. However I bought the already shredded cheese. Will that make a huge difference?